as recorded by digital photo- and certain video cameras. both on Mac OS X and Windows. RawDigger doesn’t alter the raw data in any way. RawDigger is not a raw convertor. Instead, it allows you to see the data that will be used by raw convertors. 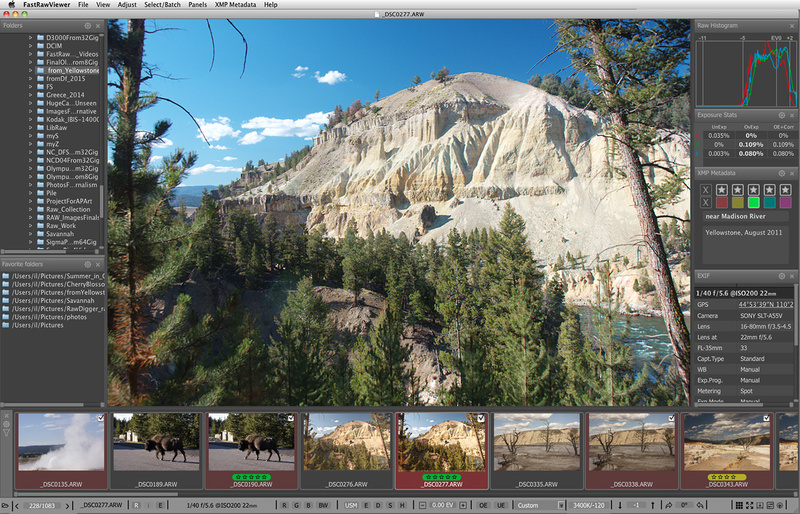 RawDigger supports nearly all cameras that have raw capability. Support for new cameras is usually implemented within few weeks after raw samples become available. 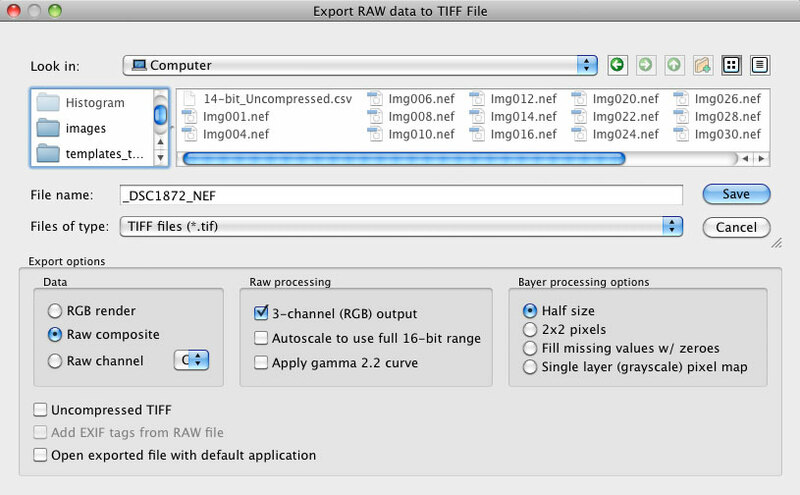 RawDigger allows one to display and research the real Raw Histogram of the raw data, which greatly differs from the in-camera histogram, as well as histograms presented by most of the raw converters. 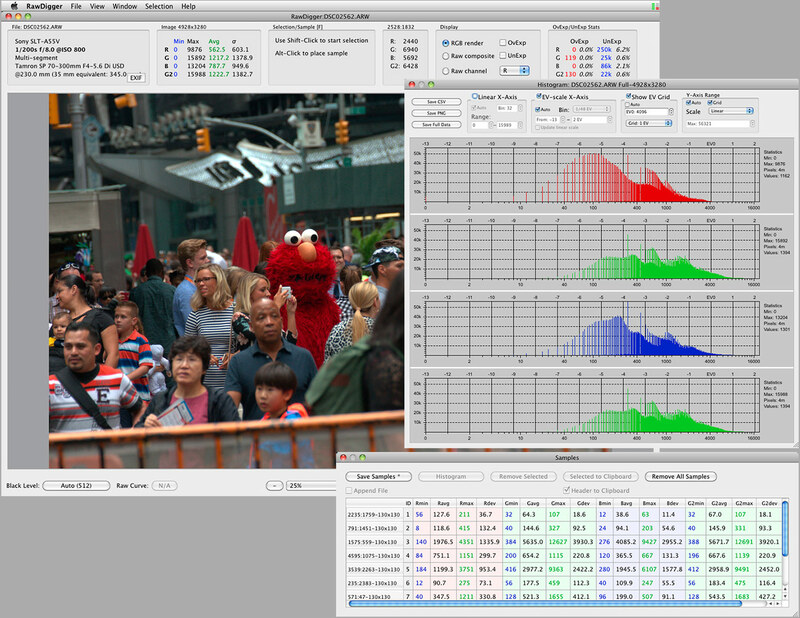 To facilitate accurate raw image study, the histogram can be displayed in different modes, over the whole image or rectangular selections of the portions of the image. The histogram can be exported for further study as a spreadsheet (CSV), or as a PNG for presentation. Overexposure and Underexposure Statistics will show the percentage of overexposed and underexposed pixels. The Overexposure (OE) and Underexposure (UE) Indications will show you exactly what areas of the shot are blown out or underexposed and in which color channel(s) it happened (best if used in per-channel view). One can set the level of Underexposure (UE) indications according to one's needs. Plot and save per channel raw data histograms for both the entire file and for an arbitrary rectangular area of the file (selection); the histograms can also be saved as graphics (PNG) or as a table (CSV) for further external processing. Calculate the statistics per channel (minimum, maximum, average, root-mean-square deviation StdDev) for the entire file and for an arbitrary rectangular selection. Save the results of the calculated statistics in a processing-friendly form - CSV, CGATS (for an arbitrary number of rectangular areas of the file). Save the compression curves of raw files in a tabulated form (for cameras and raw data formats where such curves are used). What will you get out of using RawDigger? 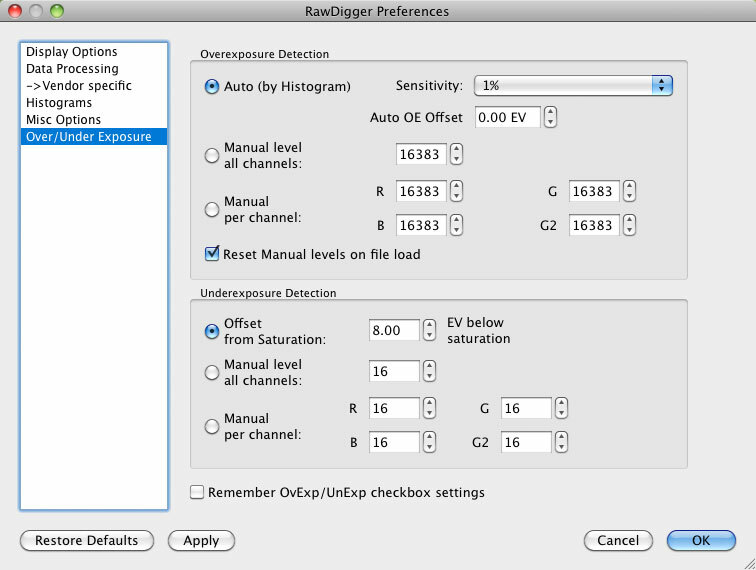 RawDigger allows determination of how the exposure meter is calibrated and what raw level corresponds to the midpoint of in-camera histogram. 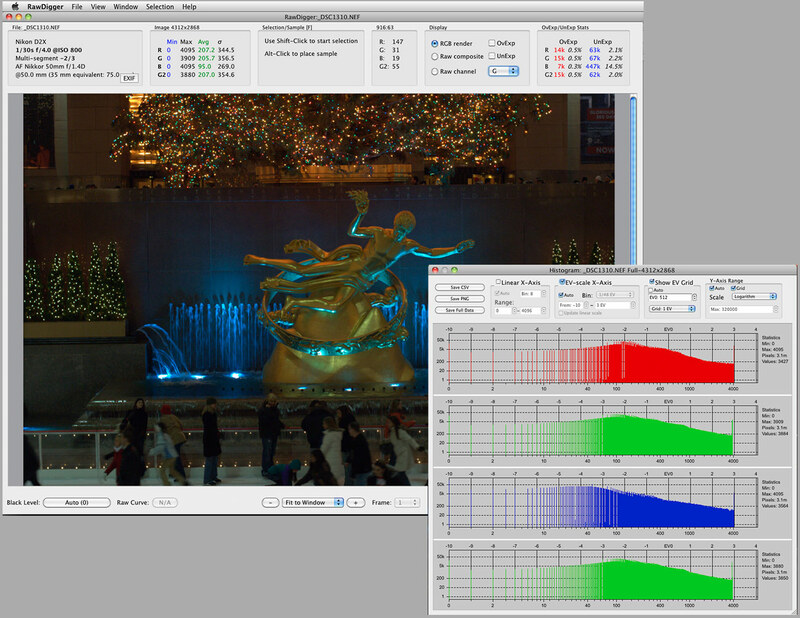 That is, RawDigger lets you establish the headroom in highlights and obtain optimal exposures. RawDigger helps determine the raw level at which the overexposure "blinkies" start on the camera LCD, and it helps know how much headroom is still available after the blinkies start showing or the histogram hits the wall. If the shadows look blotchy or colorless, or details in the shadows are poorly resolved, you will be able to determine how much they are underexposed and set the Underexposure (UE) indicator in RawDigger accordingly. 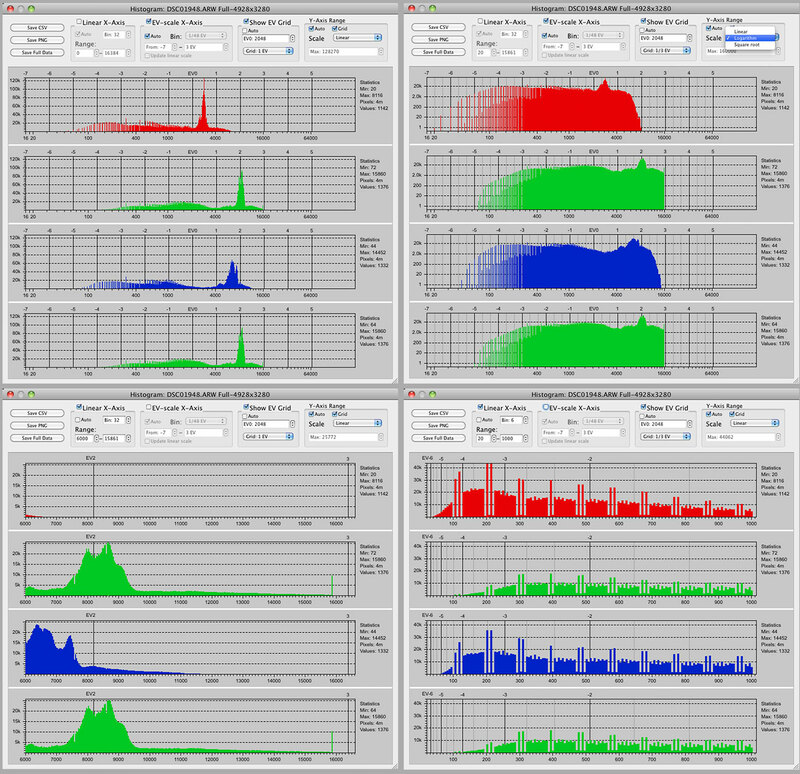 RawDigger is a useful tool for examining how the relative per-channel underexposure depends on the color of light. RawDigger is more precise than any exposure meter for the purpose of evaluation of the uniformity of fill light and reproduction light setups (in terms of the evenness of both color balance and luminosity across the background). Investigate what conditions cause an unacceptable level of noise in shadows. Estimate the level of noise that is introduced by the converter, compared to natural noise coming from the camera sensor. 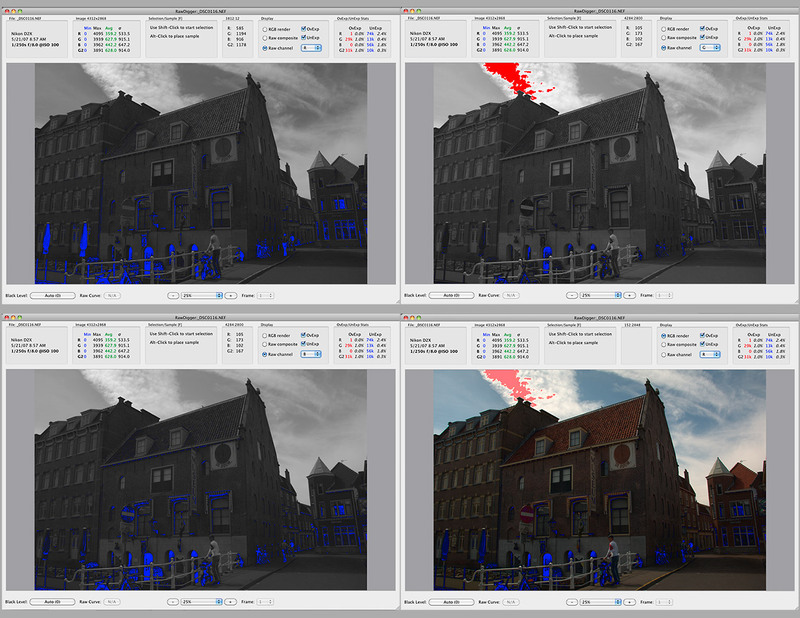 Compare the noise between two cameras of the same make and model. This allows for further analysis using ImageJ, Matlab, etc. It is also possible to further process such TIFFs in image editing applications like Photoshop, including normal post-processing. In that case, the camera color profile needs to be assigned in the image image editing application. The Exposure Edition is intended for everyday use, to help those who are serious about extracting the maximum quality from the camera through getting precise exposures. It is used to determine the calibration of in-camera exposure meter and quantify different vignetting sources, as well as improve the light setup in studio when it comes to uniformity and dynamic range. 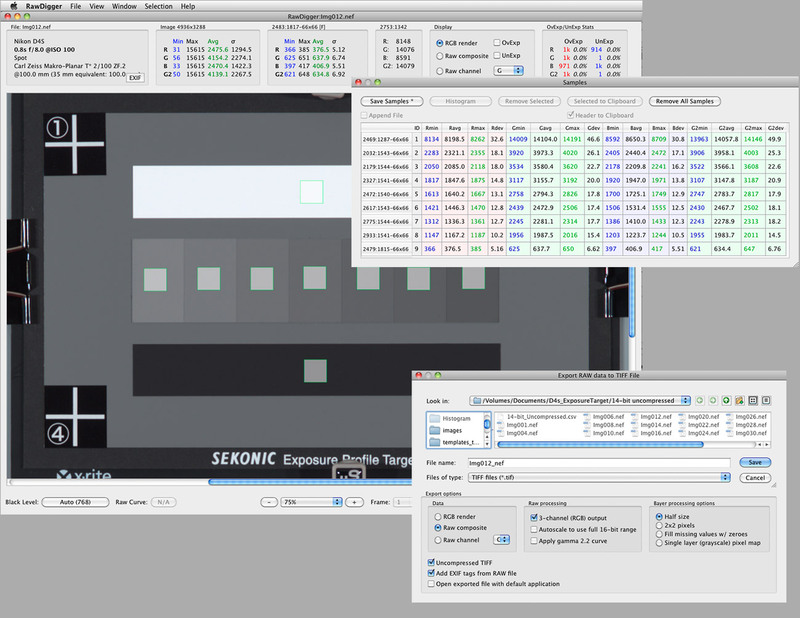 Exposure Edition: displays RAW data in all modes (RGB, RAW Composite, and RAW per channel), indicates over- and underexposed areas, displays RAW histogram, image statistics, statistics and histogram for selected area. The Research Edition is meant for camera/sensor evaluation and statistical analysis of raw data. It is used for a wide range of tasks, from personal use and preparing reviews to the programming of RAW data processing. Among other things, it is suitable for the study of flare and glare and resulting characteristic curves, checking lens transmission symmetry, and setting even lighting. Research Edition adds: TIFF export; multiple selected areas via samples; tables of sampled data; statistics and histograms over multiple samples; exporting sampled data as CSV and CGATS. The Profile Edition is designed for advance study of sensor and lens behavior. Among other things it allows to create sensor calibration data, linearization data, or device data for color profiling. 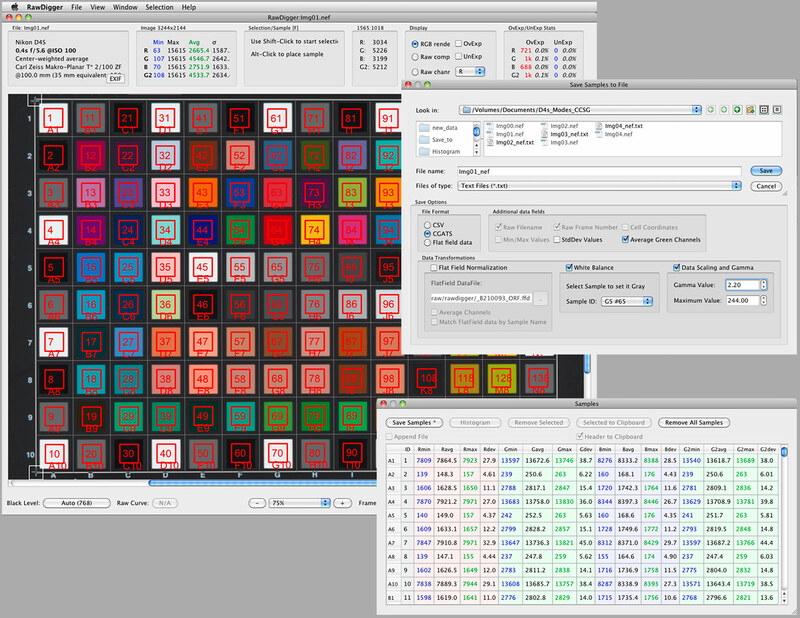 In addition to the features provided by the other two editions, the Profile Edition includes selection grids for faster processing of step wedges and color targets, as well as for calculating non-uniformity maps. 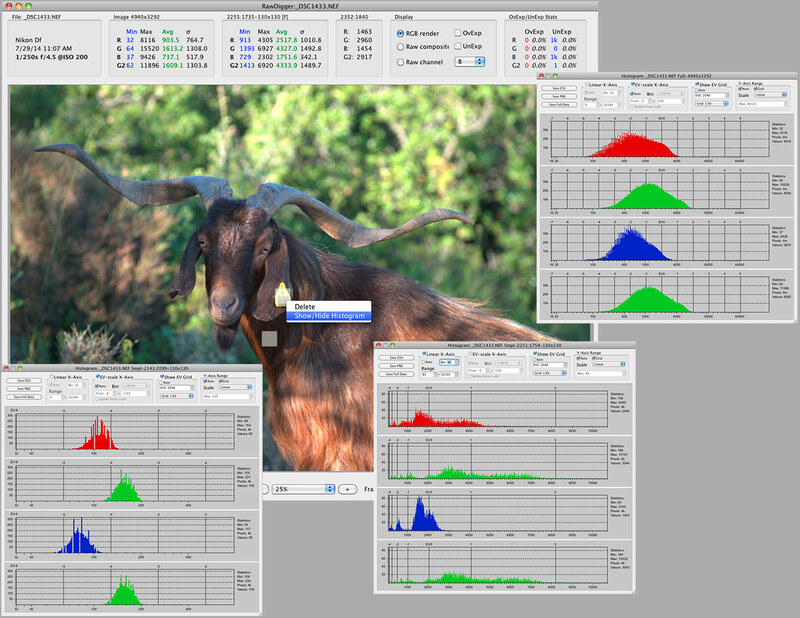 The Profile Edition allows applying white balance, normalization, equalization (Flat Field normalization), and filtering of outlying values before data export. FastRawViewer is a must have; it's all you need for extremely fast and reliable culling, direct presentation, as well as for speeding up of the conversion stage of any amounts of any RAW images of every format. 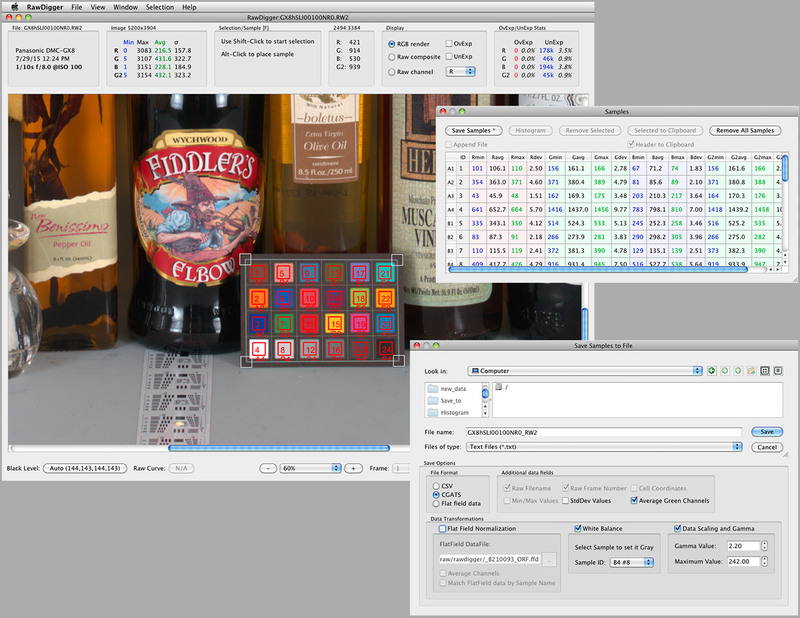 Now with Grid Mode View, Select/Deselect and Multiple Files operations, Screen Sharpening, Highlight Inspection and more.